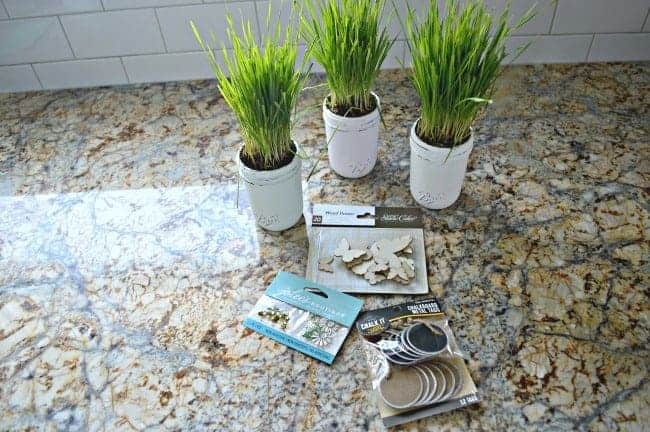 Chalk paint mason jar planters for spring. 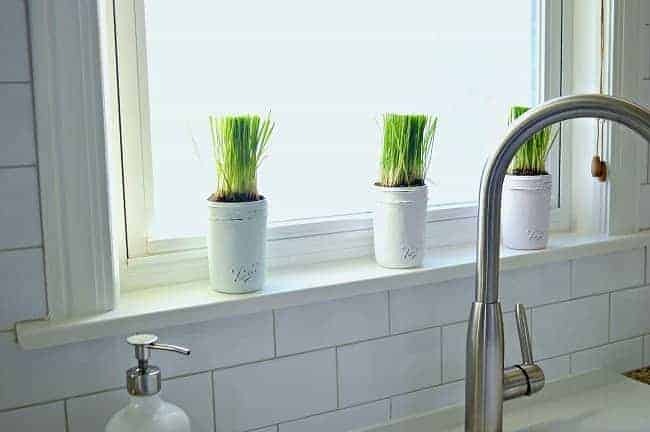 The idea behind this simple DIY was to use pastel chalk paint and live greenery to add a bit of spring to my new kitchen. I had to tweak my original idea, but I love how they turned out. 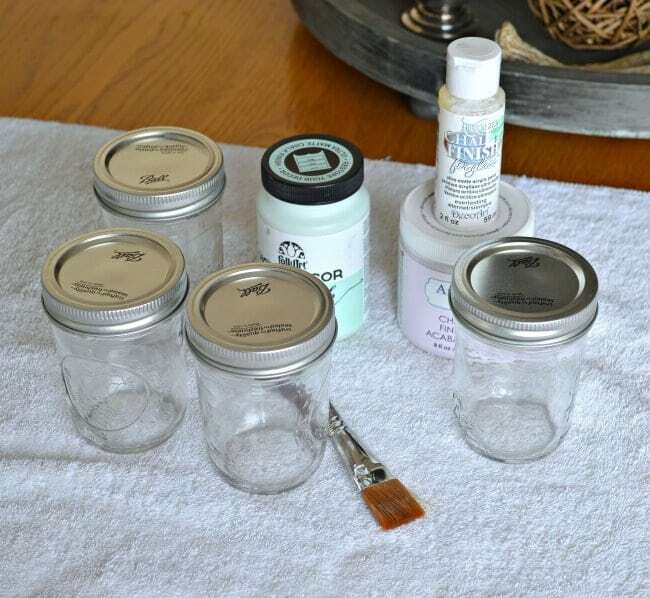 You can’t get any easier than slapping a couple of coats of chalk paint on mason jars. 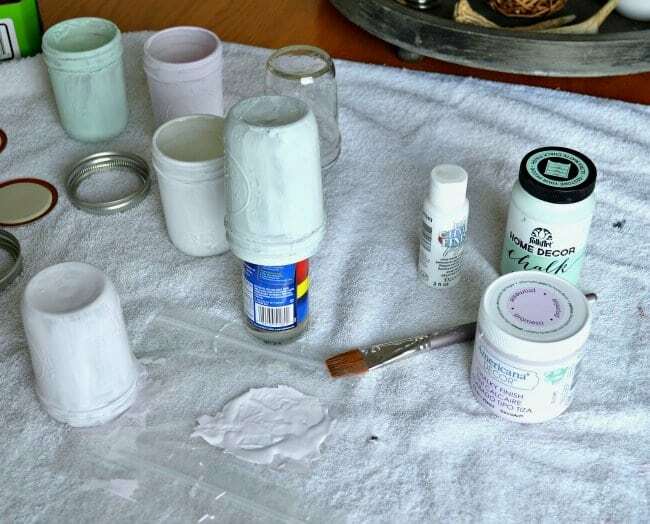 There was no prep involved but I did use a bottle to make it easier to paint each jar, and I also toned down the green and pink chalk paint with a bit of white. Once they were dry, I lightly rubbed a buffing pad over each jar to smooth out some of the brush marks. Then I took a piece of course sandpaper and sanded the high spots to bring out the words and designs. Next, it was time to play in the dirt. 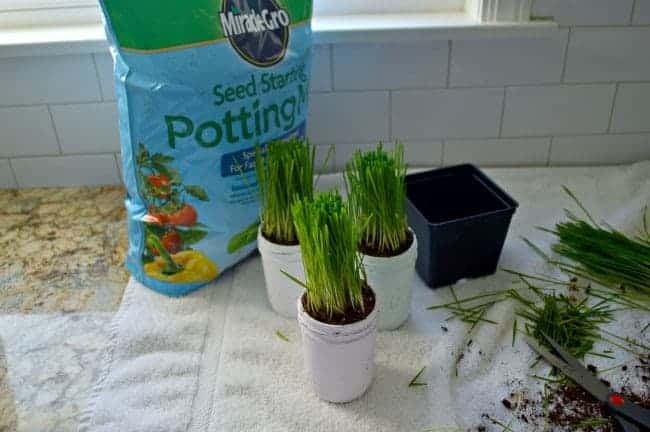 I was going to plant a few seeds in my jars but ran out of time, so I went for wheatgrass instead, with its bright green color. Perfect for spring. Each jar got a handful of potting soil and a clump of grass. After a little haircut, they were ready for their spot on the windowsill. I loved the spring color but something was missing, besides the fact that their haircut was a little too perfect. Oops. 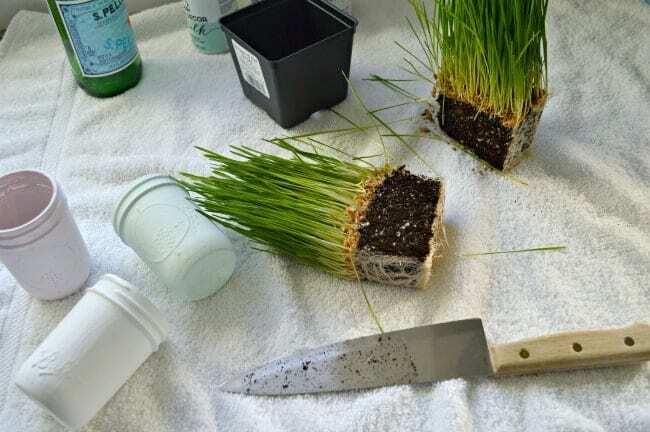 One thing about wheatgrass is that it grows quickly so their uniform haircut only lasted a day before it started growing out. Besides the new growth, I thought the addition of a spring tag to each jar would finish it off. I had the tags in my stash but when I found these cute bumblebees and butterflies, I could hardly wait for the glue to dry so I could tie them on. Just what they needed, don’t you think? I won’t get to enjoy them in my new kitchen for as long as I’d hoped, but I can always recreate them in my new home. 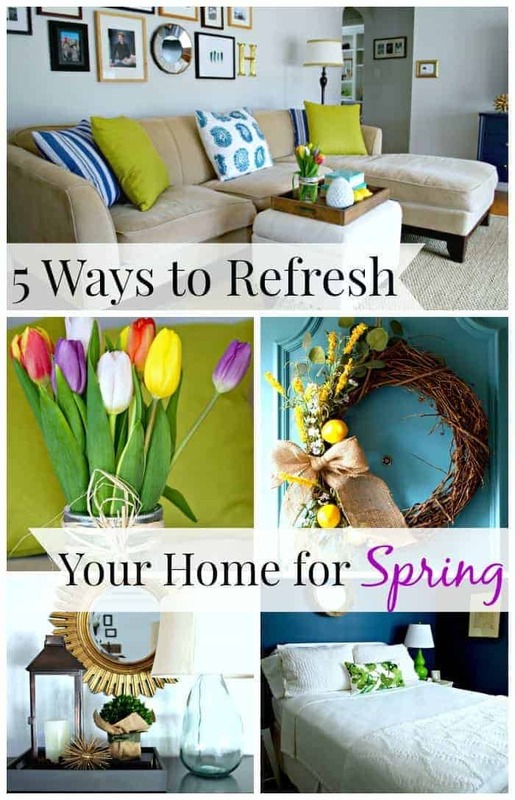 Check out some other spring posts. Outstandingly gorgeous! This is a perfect idea. Thanks for sharing. where do you get wheat grass or the seeds? I’ve never seen them in stores or seed catalogs. I love your Mason jars. They’d make a good planter for herbs. 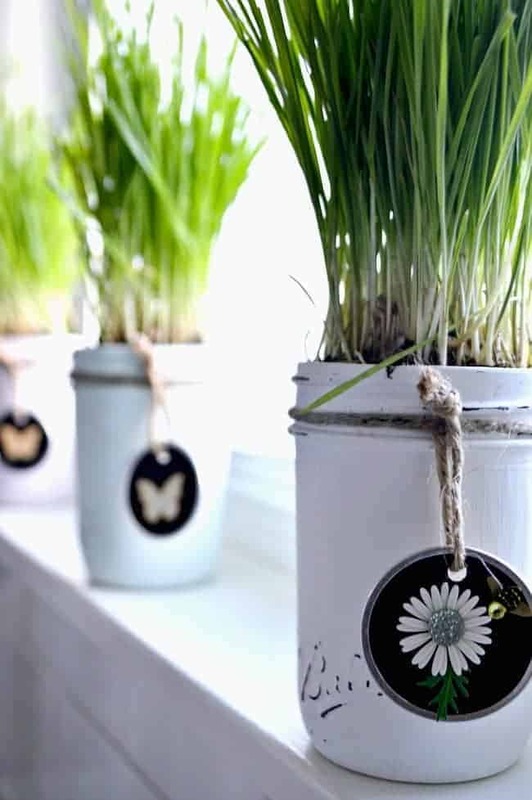 Since you grew grass in the jars, it would be cute to put faces on the jars with tag “speech bubbles”. Love this project! 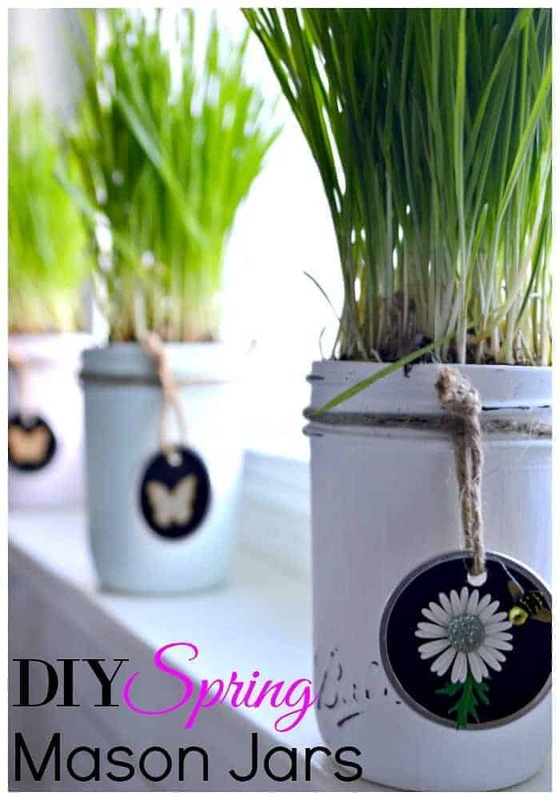 Your Spring Mason Jars look so pretty on your kitchen windowsill! 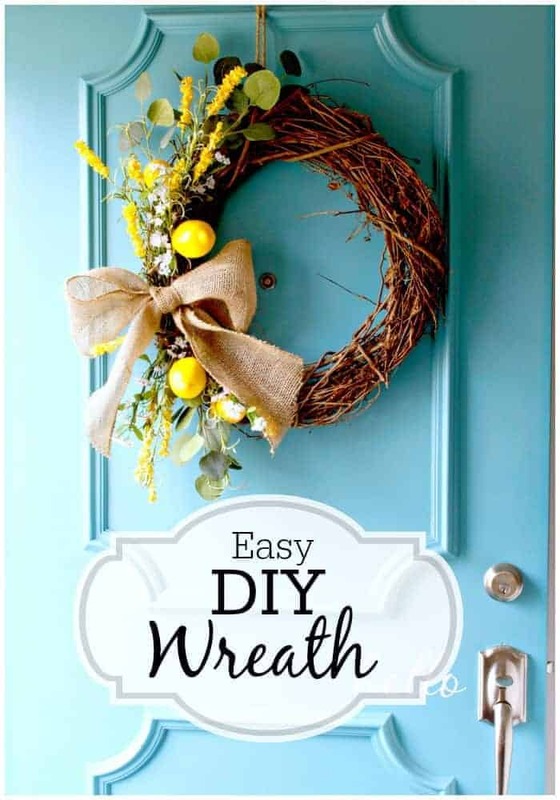 Would love for you to share at Simple & Sweet Fridays! Good Luck with your move to NC. Thanks, Jody, I appreciate it! I like how the mason jars look so upscale with the way you customized them. What a nice project. I can’t believe your still able to craft while preparing for your move! Amazing! 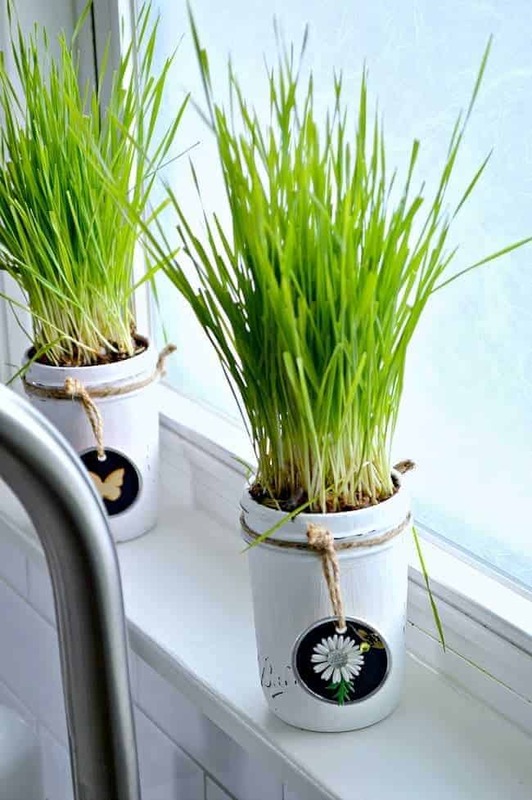 What a lovely way to add a little spring to your window sill. I love the little embellishments. You should come link these up at Welcome Home Wednesdays. Party open 7a CST Wed morning! Thank you, Erin and I appreciate the invite. I’ll be sure to stop over on Wednesday. Those look great. I love decorating for spring. 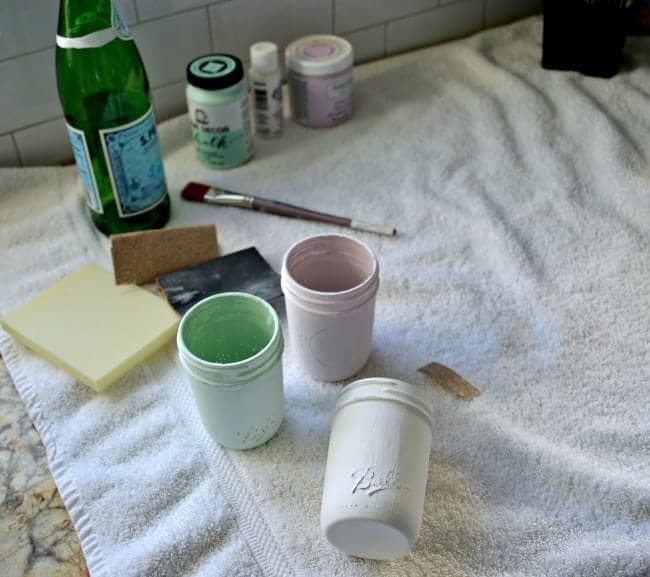 Adding a bit of white to the pink and green chalk paint is a great idea. These are so cute. I have a window opening from my kitchen to the dining room that I would like to add something to and this would brighten it up a lot. Think I will give it a try. Good luck on the move. Thanks, Jessica! 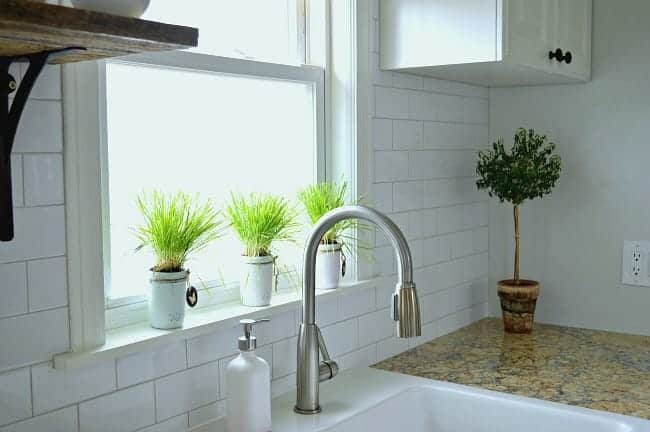 I love the color that they brought to the kitchen. 🙂 I hope that the storms that went through weren’t too bad. That is the one bad thing about spring. I love the jars! The tag just completes the project. Did I miss the fact that you have a new home in NC? Good luck with the move, I can’t wait for the next remodel! Thanks, Brenda! No, we don’t have a home yet. We will be renting until I can find the perfect one to redo. 😉 I’m really looking forward to finding it and getting started. Travel safely and enjoy your new home. Excited to follow your journey. Cute! Good luck with the move! Thanks so much Kim, I appreciate it.